Senator Ron Wyden has been promoting a universal health care plan for almost three years. And in the last few months, as it's become apparent that his plan wouldn't be the basis for final legislation, he's narrowed his cause to promoting one of its chief elements: "choice." The idea works this way: Under the proposals moving through Congress, most people with access to employer-sponsored insurance would have to take it. Wyden wants to give these people an additional option: The ability to turn down that coverage, and then use their employers' contributions in order to purchase a policy through one of the new insurance exchanges--which, under current proposals, are being set up primarily for the self-employed and small businesses. But the staunch opposition of employers and unions, who for various reasons oppose any disruption of existing employment-based benefits, seems likely to block this effort as well. That's left Wyden looking for a compromise--a measure that might at least put down some sort of marker. It looks like he may have found one. Working with Senate Finance Chairman Max Baucus, who during the markup hearings pledged to assist in this endeavor, Wyden has devised a proposal that would open the exchanges to a narrow, but important group of people with job-based coverage. Under the Finance bill's terms, people can already opt out of employer policies and use the exchanges--taking advantage of the government subsidies available there--if they can demonstrate that paying their share of premiums for an employer policy would cost more than 10 percent of their household income. At the same time, people who can demonstrate that paying for insurance would cost more than 8 percent of their household income are exempt from the individual mandate--that is, the requirement to buy insurance altogether. As you can see, there's a gap there. If you work for a company that offers insurance, but the premiums would take between 8 and 10 percent of your income, then you would not be required to pay for that coverage--but, simultaneously, you wouldn't have access to the subsidies that might help you buy a different policy even if you wanted. Wyden wants to let these people enroll in the exchanges--and take their employer contributions with them, to help pay for the coverage there. In effect, the employer contributions become their "subsidies." If they can find an exchange policy that costs less than their employer contribution, they can pocket the difference as cash. 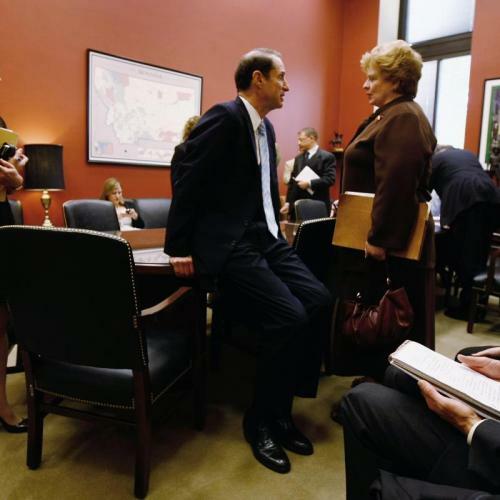 Wyden has suggested that his proposal would accomplish several things at once. It'd give people more insurance options and, by encouraging them to shop around for the best buy, promote more competition among insurers. If this proposal went through, that's what would happen--at least for people who fall into that gap. How many people is that? Wyden just received a formal estimate from the Congressional Budget Office. CBO examined two possible iterations of the proposal. Under the one most likely to pass--it's not worth going into why, at least right now--about a million people would end up taking advantage of the option. That's not a huge number, obviously, but it's enough for Wyden to put down his marker. And at $5 billion over ten years, it's very little money--a rounding error, really. Like any such proposal, this one raises some tricky design issues. It'd have to be crafted carefully, to prevent employers and employees from gaming the system. But that seems doable--and, more important, this idea seems worth doing. Note: For the record,there are better ways to deal with that gap. The real solution is to exempt fewer people from the individual mandate--by improving the subsidies, so that more people can afford to buy insurance. But if that were to happen--say, in conference committee--there's no reason this amendment, or some similar version, couldn't still be part of the final legislation.